One of the major components of the engine is the accessory drive belt system that is made up of the drive belt, tensioner and belt pulleys. This system powers certain accessories and key components in a vehicle. It is not uncommon when one component stops working other components soon stop working and the vehicle stops operating. 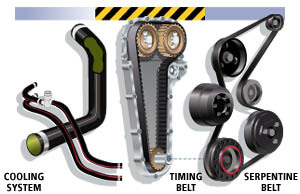 Most new model vehicles incorporate a single serpentine drive belt instead of the individual belts to drive the accessories. The tensioner is used to insure that the belt stays snugly in place while the vehicle is operating. It can be a spring-loaded or hydraulic automatic type or a rare manual type found in older vehicles. Pulleys are used to direct the belt. They are spring-loaded and most likely have bearings inside them that give the pulleys longer life.